♥Notification:QC2.0/3.0 Car Charger needed and iPhone system iOS 11.2 needed for FAST Charging. ✔Support Samsung 10W and iPhone 7.5W FAST Wireless Charging. ✔Automatic Car Wireless Charger Air Vent Phone Mount Holder. ✔Built-in Infrared Auto-sensing, and Motor Gear drive. ▶Fully Automatic◀The unique infrared auto-sensing and motor-driven design to grip and open phone automatically. New feeling for innovation. ▶One-hand Operation◀Infrared auto-sensing and the touched on-off button on left side can make you finish all what you want to do only with one hand, which avoids distracting the driver's attention, keeps focus on driving. 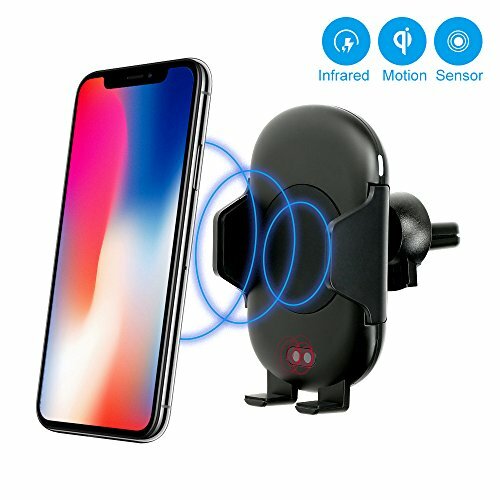 ▶2 in 1 Function◀It's wireless charger for all devices with QI standard,and it's the infrared automatic phone holder for other phones which can be charged by universal car adapter(it's not included). ▶Wireless Charger Application Models◀It is compatible with all Qi enabled devices such as iPhone8/iPhone 8 plus/iPhone X Samsung S9/S9+ /Note8/S8+/S8/Note5/S7 edge/S7/S6 edge plus/S6 edge/S6 Xiaomi MIX 2S and other qi-enabled device. ▶Easy to Install◀360 degree rotation interface and air vent design make it can be installed easly.